Christian Harder has won the first ever PokerStars Championship Bahamas Main Event for $429,664 after striking a deal with his former backer Cliff Josephy heads-up. 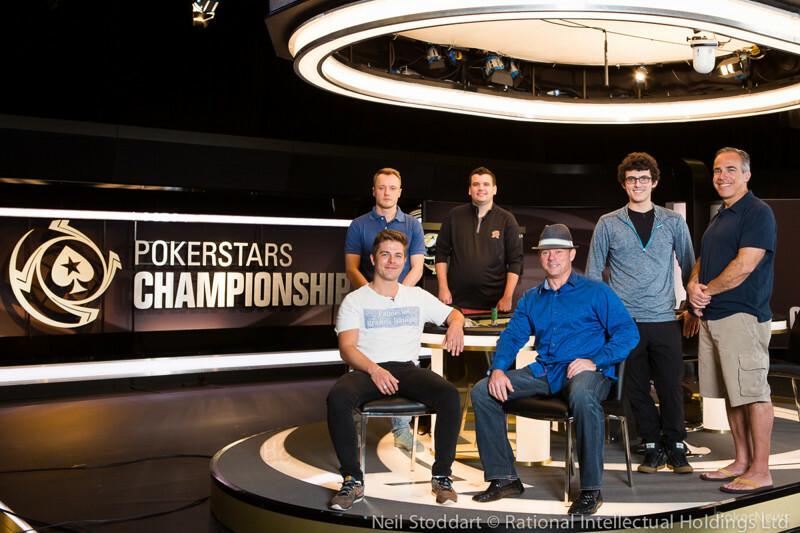 The six-handed final table started at noon and would become five-handed quick enough. Rasmus Glæsel lost some chips early on and said his goodbyes in the seventh hand of the day after losing a flip with ace-king to Cliff Josephy's pocket tens. There was no ace, king or other escape outs for Glæsel and the Norwegian poker player hit the rail in sixth place, good for $103,780. It would take another 99 hands and several hours before the next player had to go. The start of day chip leader, Michael Gentili saw things go sour in the 106th hand of the day as he doubled Aleksei Opalikhin with deuces to the Russian's aces. Gentili was extremely short after that and called all in the next hand with nine-seven to Cliff Josephy's king-ten suited. 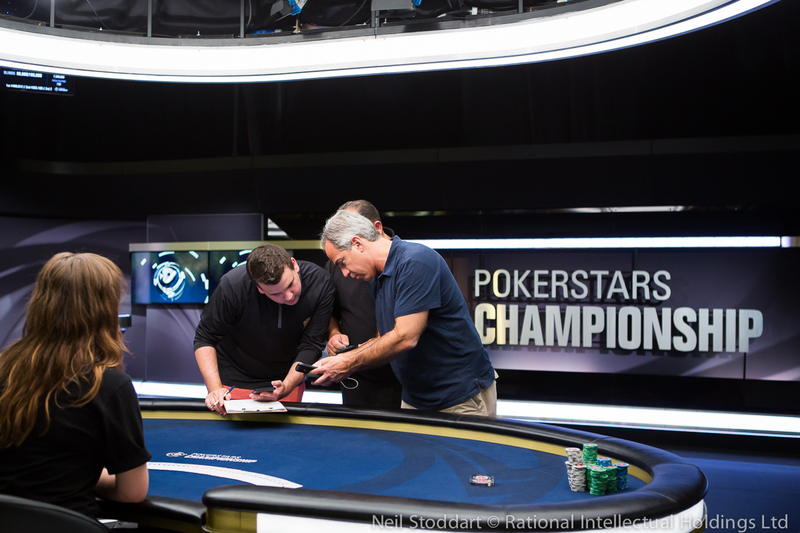 Both paired up but Josephy's hand remained the better one and Gentili went home with $140,940 for his fifth place finish. While Aleksei Opalikhin had won most of Gentili's chips, he would be the next to go as he too lost a big flip to Josephy. This time Josephy had pocket nines while Opalikhin brought king-queen suited to battle. A board no higher than a ten left Opalikhin extremely short and he was gone the next hand. Vela had pocket kings and knocked out Opalikhin who did not connect enough with ten-nine off suit. Again, the one responsible for a knockout was next to go. Michael Vela found himself short and squeezed all in with ace-six suited. He was called by both Christian Harder with ace-queen and Cliff Josephy with king-jack. Vela paired his six but four diamonds made a flush for Josephy who sent Vela packing in third position. After the elimination of Vela, the two remaining players reached an agreement in their deal talks soon enough. Christian Harder secured himself $419,664 while Josephy had $403,448 locked up after the deal, with $10,000 still left to play for. 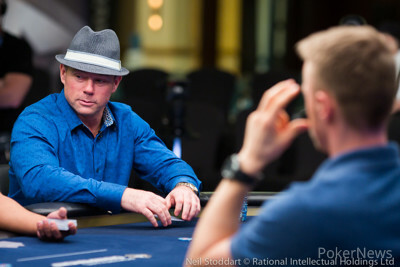 Christian Harder made the final table of the PokerStars Caribbean Adventure back in 2008 where he finished seventh for $200,000, only his second-ever live cash. Harder returned every year and now, on his 10th straight trip to The Bahamas, he was in a position to take it down. Across from him sat Cliff Josephy who was his backer in 2008 when he hit the spotlight here. Josephy, who finished third in the 2016 World Series of Poker Main Event for $3,453,035 and won a side event at the WPT Five Diamond World Poker Classic for $163,250 last December, started with nine million in chips to Harder's 12 million. It didn't take long as Josephy lost chips at rapid pace getting outkicked by Harder on more than one occasion. Soon enough, it was all over as the two poker friends got it in with ace-eight for Josephy and ace-jack for Harder. The board bricked out for Josephy and he had to settle for second place. 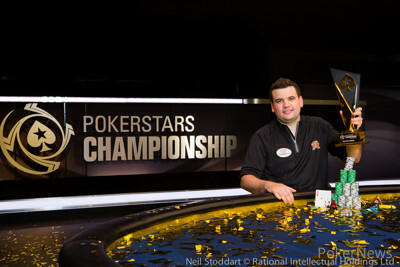 Christian Harder, after having finished seventh in this event in 2008, is now the winner of the PokerStars Championship Bahamas! The first-ever PokerStars Championship is in the books, and the next one up is in two months when the elite PokerStars live tournament sets foot in Panama for the first time. PokerNews.com will be on the floor for that event too, so be sure to follow the live updates coming from Panama's capital March 11th. Hand #151: Josephy raised to 400,000 with . Harder paused for a moment and three-bet to 1,100,000 with . Josephy wasted no time and moved all in for 6,100,000. Harder asked for a count and eventually he called. The flop came , keeping Harder well ahead with ace-jack high. "Back doors", said Harder. The turn was the and now Josephy picked up outs to make a flush. The river was the and Josephy was eliminated in second place. Hand #143: Cliff Josephy raised to 400,000 on the button with and Christian Harder called with . The flop came . Harder checked and Josephy bet 400,000. Harder called. The turn was the . Harder checked again. Josephy bet 800,000. Harder called. The river was the . Harder checked for a third time. Josephy checked back and Harder took down the pot. Hand #144: Harder raised to 360,000 on the button with . Josephy called with . The flop came . Harder bet 225,000. Josephy called. The turn was the . Both players checked. The river was the . Both players checked and Josephy took down the pot. Hand #145: Josephy raised to 400,000 with and Harder defended with . Both players checked the flop of . The turn was the . Harder led out for 400,000 and Josephy folded. Hand #146: Harder raised to 380,000 with and Josephy defended with . The flop came . Josephy checked and Harder bet 340,000. Josephy check-raised to 1,600,000. Harder went into the tank and then moved all in. Josephy folded. Hand #147: Josephy raised but no cards or amounts were shown. Harder folded . Hand #148: Harder raised to 360,000 with . Josephy three-bet to 1,100,000 with . Harder folded. Hand #149: Josephy gave Harder a walk. Hand #150: Harder limped in with . Josephy raised to 540,000. Harder folded. Christian Harder and Cliff Josephy have reached an agreement. Harder secured himself of $419,664 while Josephy has $403,448 locked up. There's still $10,000 in the middle to play for and action is back underway. Hand #142: Christian Harder found and raised his button to 350,000. Small blind Cliff Josephy called with before big blind Michael Vela shoved for 1,485,000 holding . Harder tanked for a bit and called. Josephy thought about it for some minutes before he too called. With now 4,515,000 in the middle, Vela could be back in it if he somehow would overcome his disadvantage. "I'm checking dark for the first time in my life" Josephy said. The flop came , pairing Vela. Harder checked behind and they both checked the on the turn and on the river as well. "Somebody has to got have a diamond!" Vela said. 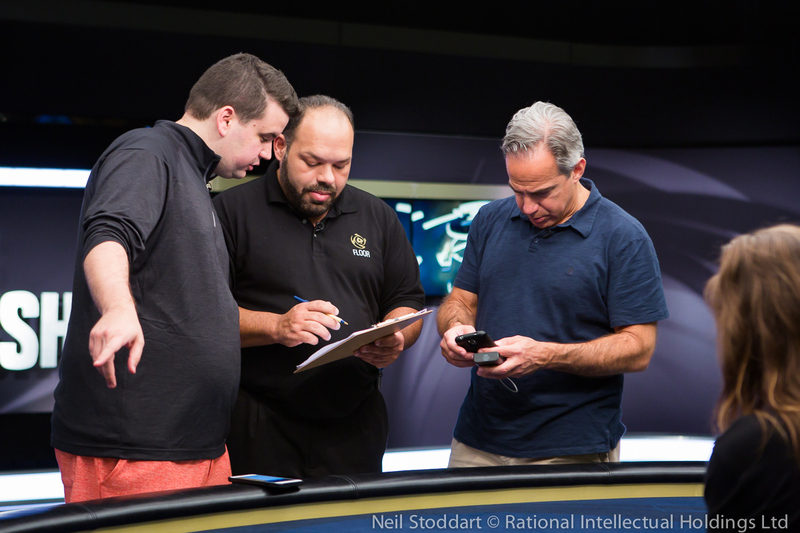 Vela got the bad news soon enough as Josephy showed the diamond he had to make his flush. "What an ugly way to go" Vela said. "It's going to be boring here now" Josephy said while shaking hands with the third place finisher. Michael Vela out in third place for $259,980. 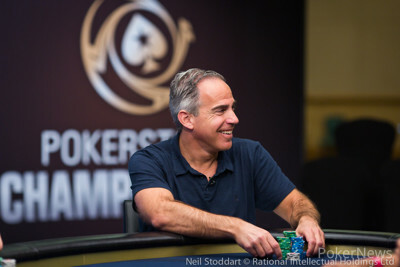 The two remaining players, Christian Harder (12 million) and Cliff Josephy (9 million) are guaranteed $353,100 and will battle for that first place prize of $480,012 when they return from the short impromptu break. Hand #133: Christian Harder was on the button with and raised to 350,000. Michael Vela defended the big blind with . He checked blind. The flop came [jcjd4]. Harder bet 250,000. Vela called. The turn was the . Both players checked. The river was the . Vela checked. Harder bet 475,000. Vela folded. Hand #134: Cliff Josephy limped in on the button with . Michael Vela moved all in from the small blind with . Both of his opponents folded. Hand #135: Christian Harder was in the small blind with and he limped in. Cliff Josephy was in the big blind and checked his option with . The flop came . Harder bet 175,000 and Josephy folded. Hand #136: Cliff Josephy limped in with from the small blind. Michael Vela checked his option in the big blind with . The flop came . Josephy led out for 175,000. Vela called. The turn was the . Josephy checked and Vela bet 275,000. "Here Cliff. Want me to put them in hundred stacks for you?" asked Vela. "I just want to see how much you're playing so I don't make any mistakes. Thank you" responded Josephy. Josephy called. The river was the . Both players checked and Josephy took the pot down with a pair of fives. "Oops", said Vela. Hand #137: Christian Harder got a walk. Hand #138: Christian Harder was in the small blind with and he raised to 400,000. Josephy called from the big blind, only showing the . The flop came . Harder led out for 315,000. Josephy folded. Hand #139: Christian Harder raised to 350,000 with on the button. Cliff Josephy was in the small blind with and three-bet to 950,000. Harder folded. Hand #140: Michael Vela shoved from the small blind with for 1,305,000. Harder folded the from his big blind. Hand #141: Christian Harder completed the small blind with and Josephy checked from the big. The flop came and both players checked. The on the turn paired the board and Harder took a step of 175,000. Josephy called in position. The completed the board and two checks later, Josephy took down the hand. We missed several hands because of segments on the live stream. We continue our numbering where we left off. Hand #127: Michael Vela shoved all in with from the smaller blind but found no callers. Hand #128: Michael Vela was all in again, this time for 2,535,000 with . Hand #129 Christian Harder raised to 350,000 on the button with . Everyone folded. Hand #130: Cliff Josephy with on the button raised to 380,000. That delivered him the blinds and antes because both of his opponents folded. Hand #131: Cliff Josephy with raised to 380,000 on the button. Again two folds as both blinds had non playable hands. Hand #132: Christian Harder with in the small blind raised to 405,000. Cliff Josephy folded. Christian Harder leads as the final three players have gone on a 60-minute dinner break.